What Are You Watching? is a weekly space for The A.V Club’s film critics and readers to share their thoughts, observations, and opinions on movies new and old. The thing about the dross of the early silent period, especially the stuff that came out of the Unites States and Great Britain, is that the titles often sound like really spot-on parodies of the era, like Mr. Pecksniff Fetches The Doctor (1904). Pecksniff is a legitimately terrible film by the British cinema pioneer Robert W. Paul that contains one interesting moment: a sequence where the father-to-be of the title dashes madly down a real city street but arrives, a cut later, at a house that is represented by a painted backdrop, like something you’d see in a community theater. In the mid-1900s, Paul (who also made plenty of good movies) had a habit of mixing real London locations with completely phony painted studio flats. In a way, his films embody an unspoken conflict about the kind of reality audiences were used to seeing in movies at the time: It was either flat and obviously artificial, like in a vaudeville theater, or it was simply the real thing, with very little in between. One of the rare exceptions is actually another Robert W. Paul movie, which I saw for the first time just recently: a good one, Footpads (c. 1896), which runs about half a minute long and depicts a man in a top hat being violently mugged while walking in London on a rainy night. Footpads might be the earliest fiction film to have been shot on a set that was meant to look completely realistic; it’s based on a real corner of Piccadilly Circus, with the accurate signage. What’s interesting here, among other things, is that Footpads came at a time when movies were still filmed under either direct or bounced daylight, so the shadows and the reflections of the street lamps in the wet pavement are all painted in. I watch a lot of early silent film in general, but have been watching a lot more lately because I’ve been working on a research-intensive piece that deals, in part, with the really early history of cinema. It’s a common misconception that film began as recording technology and then blossomed into something more as the novelty wore off. There was an art to it from the beginning. But because this was a time when what we’ve come to think of as movie grammar was still being assembled through trial and error, the blunders are often illuminating. Sometimes they even produce unusual results. Part of what makes the transition from the real street to the backdrop in Pecksniff so jarring—and this is true of most of Paul’s films from the period, at least those I’ve seen—is the mismatched direction of the character’s movement. It took a long time before filmmakers learned how to convey something as simple as a person entering a room smoothly. The magician-turned-filmmaker Georges Méliès, who had a mind for ingenious solutions, got around this problem by simply having characters exit and enter at the extreme left or right of the frame; all he had to do to maintain continuity was to make sure the direction was consistent. 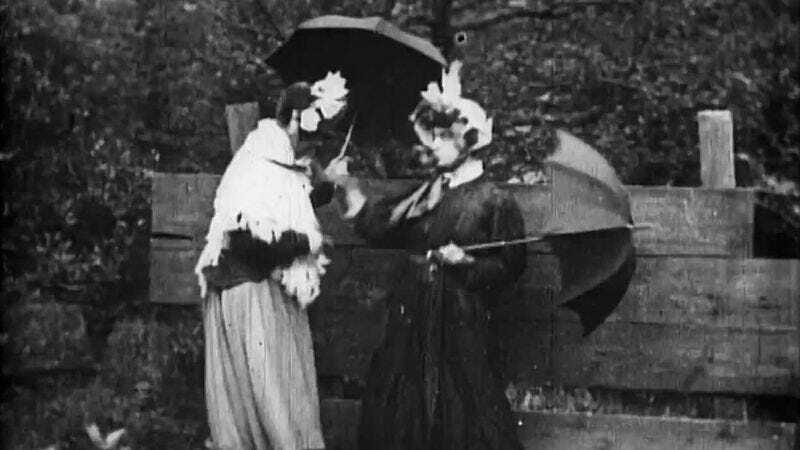 Here’s another example of a terrible early silent film with a teachable moment: Women’s Rights (Ladies’ Skirts Nailed To A Fence) (1899), also British. An entry in one of the most storied garbage genres of the early silent era, the anti-suffragette comedy, it stars two men in drag as pesky feminists who get their comeuppance. Women’s Rights sometimes finds its way into film history texts as an example of a failed early attempt at executing a matching reverse angle. Instead of changing the position of the camera, the filmmaker, James Bamforth, simply had the actors switch places; the suffragettes and the boys who play a prank on them move, but the fence and the garden around it don’t, to disorienting effect.